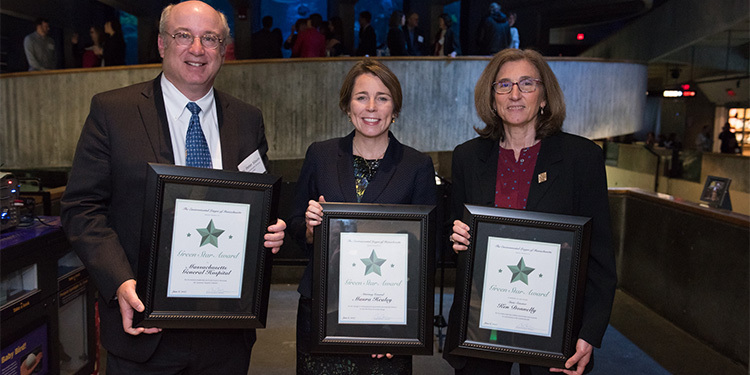 The Environmental League of Massachusetts honored the late state Senator Ken Donnelly as an environmental champion at its annual Earth Night spring gala on June 6th at the New England Aquarium. Accepting the award on behalf of the Senator’s staff and family was Cindy Friedman, former chief of staff for the senator and current candidate to succeed him. The ELM Green Star award was presented by ELM board member and former state Senator Ben Downing, who recalled the leadership of his friend and colleague on behalf of working families and the environment. Sen. Donnelly was a leader on legislation to replace toxic chemicals in manufacturing and the workplace with safer alternatives. He was also the lead sponsor on ELM’s priority landmark legislation to increase home energy efficiency by placing an “MPG” label on homes, similar to cars.